The post suggests that individuals take the Project Implicit "Implicit Association Test" to assess their own subconscious biases. I'm not sure whether it's suitable for that purpose or not. Are Implicit Association Tests effective at determining racist/sexist bias at the single-sample level? No, the IAT(or any other predictive test) does not reliably determine behavior on a specific person. A predictive test is not accurate at the individual level unless the criteria being measured matches perfectly with the criteria being predicted, and as shown below this is not the case for IAT's. According to this meta-analysis of 122 research papers representing 14,900 subjects, implicit association tests can predict unconscious bias regarding intergroup behavior which would not have been predicted by conscious self-reporting of bias. However, all other forms of bias examined in the meta-analysis were predicted better through explicit self-reporting than through IAT's. Furthermore, a combination of implicit tests and self-reporting of bias results in better predictions than predictions made with an IAT alone for all types of bias. Regardless of the type of bias being measured, overall the IAT's had a predictive validity of 0.274, and the explicit tests had a predictive validity of 0.361. This is far short of the '1' needed to perfectly predict individual behavior. A value of 0.35 is considered a decent value for predictive validity, so IAT's can be considered a below-average estimation of bias. 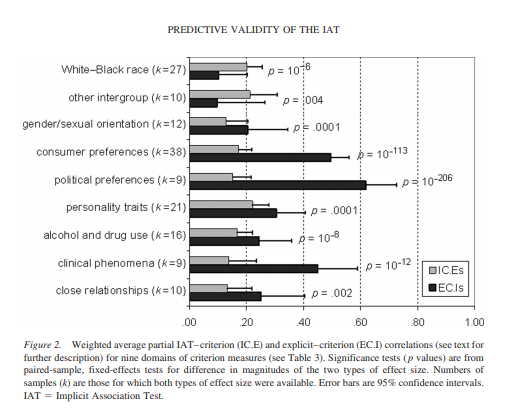 For 32 samples with criterion measures involving Black–White interracial behavior, predictive validity of IAT measures significantly exceeded that of self-report measures. In several other topic domains — especially consumer preferences, political preferences, and clinical phenomena — it was strongly evident that self-report measures predicted criterion variance not predicted by IAT measures. The finding that IEC magnitude was positively associated with predictive validity for both ICCs and ECCs was expected from reasoning that, when IAT and self-report measures agree, the constructs that they measure will likely reinforce each other in determining behavior... Confirming this expectation, IEC magnitude positively predicted 29.9% of the variability of ICC effect sizes and 34.3% of the variability of ECCs (see Tables 4 and 5). In short, unconscious interracial bias can be better predicted by IAT's than by explicit self-reporting, though other types of unconscious bias are better predicted by self reporting. Regardless of the type of bias, if the results of explicit and implicit tests match then bias can be reliably predicted. However, the predictive value for both is (far) less than 1, so a perfect prediction is not possible. Thus, an IAT cannot guarantee the bias at an individual level. Not the answer you're looking for? Browse other questions tagged psychology racism sexism . Is Sandro Del-Prete's “Message d'Amour des Dauphins” a pervert test? Is there a trend in western publishing to obscure depictions of ethnic minorities on the covers of Young Adult literature?